The summer rebuilding job at Ross County has begun after six first-team players left the club following relegation to the Championship. Tim Chow, David Ngog, Aaron McCarey, Blair Malcolm and Reghan Tumilty have not been offered new contracts, while Thomas Mikkelsen, who still had a year left on his deal and was on loan at Dundee United, has also departed. All the loan players have returned to their parent clubs but terms have been offered to the other out-of-contract squad members in an effort to keep them in Dingwall. Marcus Fraser, Liam Fontaine, Christopher Routis, Michael Gardyne, Craig Curran, Tony Dingwall and Alex Schalk have deals to mull over this week. There are also deals out to Dylan Dykes and Russell Dingwall, two of the club’s Development League title-winners from last year. Mark Foden, Sam Morrison, Max Ashmore and Kyle Johnson will also leave the club. Co-manager Steven Ferguson said: “We’ve put offers out there for guys to think about. “We’ll speak to the players again at the end of the week. “When you’re dropping down to the Championship, in this situation a lot of players will have things to think about. Chow was a regular under Jim McIntyre but struggled for game time this year, despite making his debut for the Chinese Taipei national side. Ngog was a high profile January addition but managed just one goal, a penalty against Rangers, and McCarey spent much of his time at Victoria Park playing second fiddle to Scott Fox. 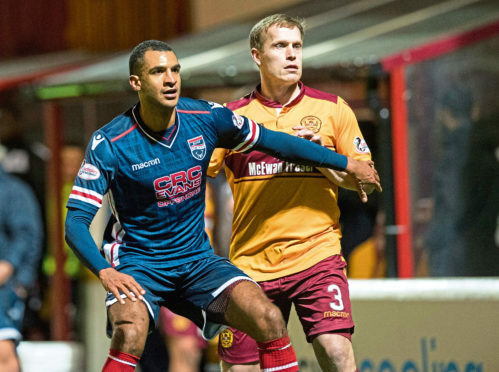 Malcolm was on loan at League 2’s bottom side Cowdenbeath this season while Tumilty had been a regular at Falkirk. Mikkelsen was signed by McIntyre but fell out of favour under his successor Owen Coyle. There has been interest in Gardyne with Dundee confident of landing the 32-year-old. Gardyne is from Dundee and spent a year in Dundee United’s first team after leaving the Staggies in 2012. Ferguson was coy on any interest in out-of-contract Caley Thistle midfielder Iain Vigurs, who is a former Staggie and has been offered a three-year deal to stay with Inverness.